Having barely escaped the Guard with their lives, losing those they love on the way, Sefia and Archer embark on an adventure to save more children like Archer, stolen, beaten and abused into being killing machines and challenge the Guard with the help of the Book, the past, and magic to challenge the Guard and ignite a revolution. Published November 7, 2017, by G.P. 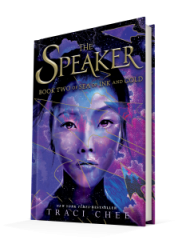 Putnam’s Sons Books for Young Readers The Speaker by Traci Chee is the second novel in the Sea of Ink and Gold Trilogy following Sefia and Archer, sorceress and warrior as they escape the Guard and fight to save others that would be broken and abused. The Speaker continues the thoughtful journey of Sefia and Archer as they challenge the darkness and death that follows them on their journey to challenge the reader society. As a novel, it is truly unique because of how the story functions. It’s not enough that the characters are so complex, but the narrative itself offers something to the novel. The story is not linear, going from the past to the present, but again, not in the typical way. Sefia is using magic to look at the history, to read into it and bring the reader into the journey. It’s a story within a story, and adventure within an adventure, painting the story in layers. This novel is nothing but layers about layers, intricately woven together. Chee does this with such control and talent, inserting the perfect story in between the narratives. The story moves effortlessly, without breaking the pace of the novel. It moves like a steady stream slowing over those rounds that build the tension of the story before carrying on. It’s amazing how smooth the storytelling is and how it moves between narratives. There’s also the character development. Sefia and Archer have both gone through so much pain, and it has brought them together, has put them on a mission to try and save others from all the pain and abuse they have gone through. It forces them to face the darkness inside them, the darkness that threatens to bubble up and swallow them whole. To see them face the darkness and both grow differently from it is incredible. Chee does an excellent job creating complex characters, characters that are as layered as the storytelling itself. They way they both see the world through their experiences changes and grows alongside them.